Sometimes you use a term over which you think there is longstanding general agreement, only to discover that others have used it with very different meaning. This is a particular danger in fields in which the literature is very weak, as it is in narrative painting. This article re-examines what is understood by a narrative painting, and narrative in paintings. Although there are ongoing disputes as to the exact definition of narrative, I think that it is fair to say that it consists of the expression in some form or forms of a story, which itself is a sequence of events. The sequence of events requires that there are at least two, and more usually at least three (Aristotle’s beginning, middle, and end, which have served us so well). The sequence almost always occurs over time: I am not sure that many of us would recognise two momentary events occurring simultaneously at different locations as forming a narrative, but I am confident that at least one person has experimented with that in writing. Events themselves involve some kind of action: a static presence alone, without at least implicit action, can hardly be narrative. Although I have claimed that a painting of an apparently static landscape can have rich implicit narrative, and stand by that, such cases are marginal at best when considering narrative paintings. Similarly, allegory can be rich in rhetoric and symbols, but if it remains static and does not tell a story, it is not narrative. Sacheverell Sitwell (1937) in his survey of British narrative painting offers the definition that narrative painting is “the painting of anecdote. It is the chosen moment in some related incident, and looking more closely into its details we must see hints or suggestions of the before and after of the story.” However in the next line he states that Frith’s Derby Day (1856) is “a perfect example of this genre of painting”, and later adds Frith’s The Railway Station (1862), populated landscapes by Cotman and Turner, and Samuel Palmer’s The Shearers (c 1833-5) to this list. Inevitably when you read his discussion of each of those paintings, he does not reveal the action taking place at the moment of the painting, nor any hints or suggestions as to what action might have taken place before or after the moment of that painting. Older accounts of paintings made in Victorian Britain are no better. Lister (1966) defines a “Victorian narrative picture” as concerning “a story, idea or anecdote” which usually “had a moral importance, sometimes it was comic, often it was a puzzle” and “more often still it was extremely pathetic”. Although some of those elements are clearly intended to narrow his choice of paintings, his inclusion of ideas and anecdotes as alternatives to a story is odd, and appears unjustified. Notable among the paintings which he includes as being examples of Victorian narrative works are street scenes, landscapes, Frith’s Derby Day (1856) and The Railway Station (1862), examples of Ford Madox Brown’s ‘baa-lambs’ paintings, and John Singer Sargent’s beautiful double portrait Carnation, Lily, Lily, Rose (1887). Anecdote was derived from the Greek word ἀνέκδοτα (anecdota), meaning unpublished, and the Oxford English Dictionary gives a general meaning of secret, private, or hitherto unpublished narratives or details of history, and an art-specific meaning of the narrative of a detached incident, or of a single event, told as being in itself interesting or striking. Julia Thomas (2000) is far more careful in what she considers to be narrative painting over the same period, but does not venture any further with a definition than “story-telling”. She also includes Frith’s Derby Day (1856) and The Railway Station (1862) without identifying any temporal sequence of events shown in those works. a narrative relates a sequence of particular events unfolding through a given period of time, and involving real or fictional individuals. Both of these educational guides adopt a conventional approach, with Langmuir even discussing the issue of the artist’s intent. William Powell Frith (1819–1909), Derby Day (study) (before 1857), oil on canvas, 39.4 x 91.1 cm, Private collection. Wikimedia Commons. 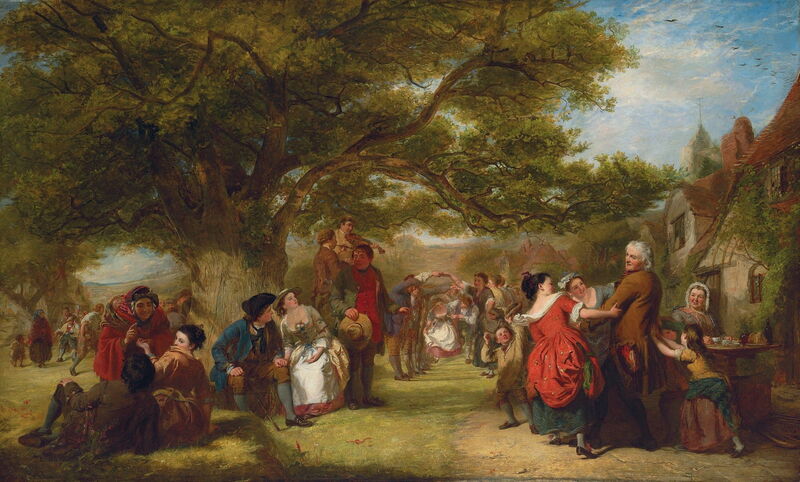 William Powell Frith’s (1819–1909) Derby Day (1856) is shown here in the form of an earlier and very similar study. Like many of Frith’s social panoramas, there is a lot of action disseminated throughout the crowd which he assembles on the canvas. However, there is no evidence or cues of preceding or subsequent linked events which might form a narrative as such. We know from the title of the painting in general terms that this crowd gathered for the Derby horse race, and we know that they will eventually disperse. But those are vague generalities, not specific events linked in time to form a story. William Powell Frith (1819–1909), engraved by Francis Holl (1866) The Railway Station (1862), original oil on canvas, this print mixed media engraving on wove, finished with hand colouring, 66 x 123 cm, Private collection. Wikimedia Commons. This version of Frith’s The Railway Station (1862) was engraved by Francis Holl in 1866 and has been finished with hand colouring. In concept, it is very similar to his Derby Day, but here shows a view of a crowded and busy Paddington railway station in London. It has the same problem establishing a narrative. Take, for example, the incident happening at the extreme right, where a man dressed in brown clothes is apparently in the process of being arrested whilst trying to board a train. We do not know what event has preceded or precipitated his arrest, nor do we have any inkling as to whether he will try to run off, or be taken into custody. It is a single event, not a temporal series of two or more events linked together. William Powell Frith (1819–1909), An English Merrymaking a Hundred Years Ago (1847), oil on canvas, 113 x 185.5 cm, Private collection. Wikimedia Commons. There is not a shred of narrative to be seen, unless we care to invent it in our own minds. William Powell Frith (1819–1909), The Crossing Sweeper (1893 copy of 1858), oil on canvas, 43.5 x 36 cm, Private collection. Wikimedia Commons. 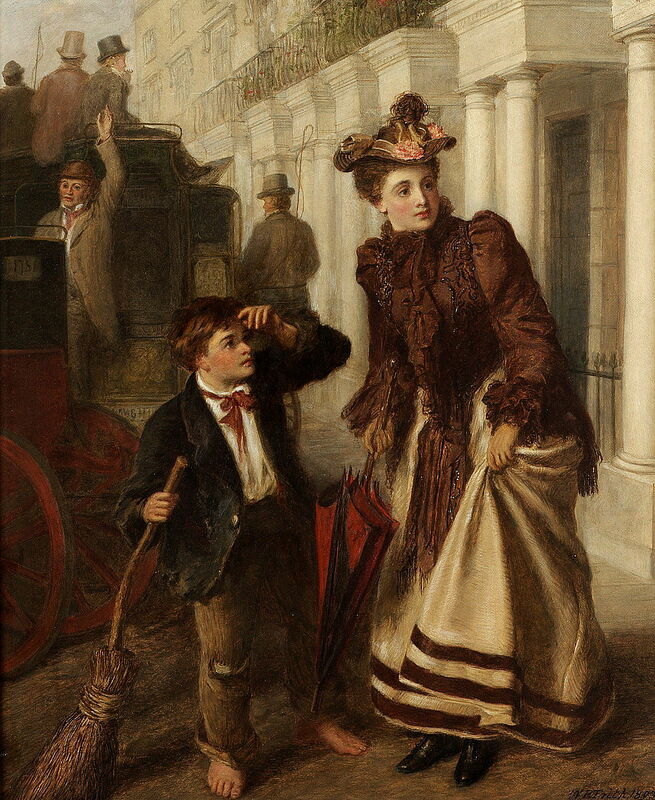 Frith’s The Crossing Sweeper (here an 1893 copy of the 1858 original) looks as if there could be narrative constructed around it, but was one of a very large number of similar genre paintings, in this case linked to various similar characters in Dickens’ novels about London. But no specific character in Dickens appears to be referenced, so it lacks the support of narrative text. Ford Madox Brown (1821–1893), Pretty Baa-Lambs (1851/9), oil on panel, 76.2 x 61 cm, Birmingham Museum and Art Gallery, Birmingham, England. Wikimedia Commons. 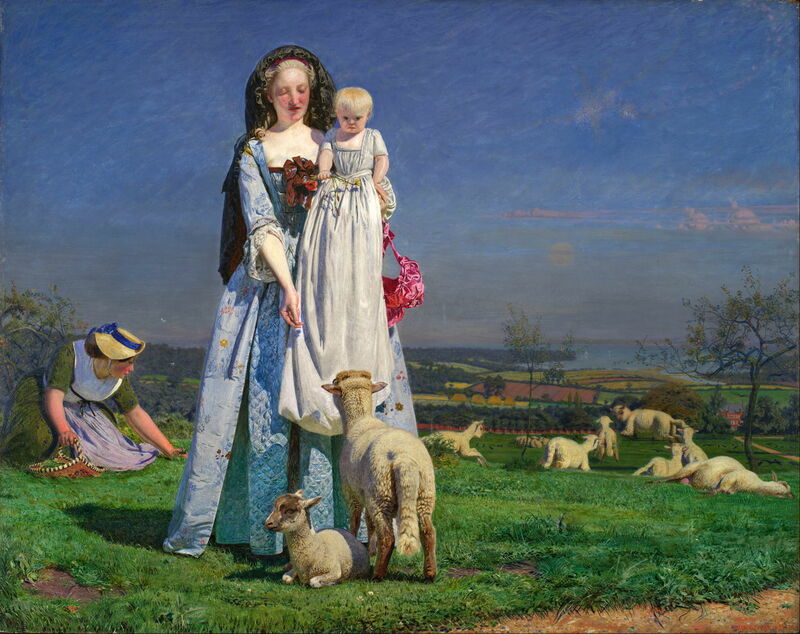 The problems with Ford Madox Brown’s (1821–1893) Pretty Baa-Lambs (1851/9) are even more apparent. A sickly-sweet over-sentimental pastoral, there can be few figurative paintings which have less narrative content. Perhaps I am missing something obvious. Samuel Palmer (1805-1881), The Shearers (c 1833-5), oil and tempera on wood, 51.4 x 71.7 cm, Private collection. WikiArt. 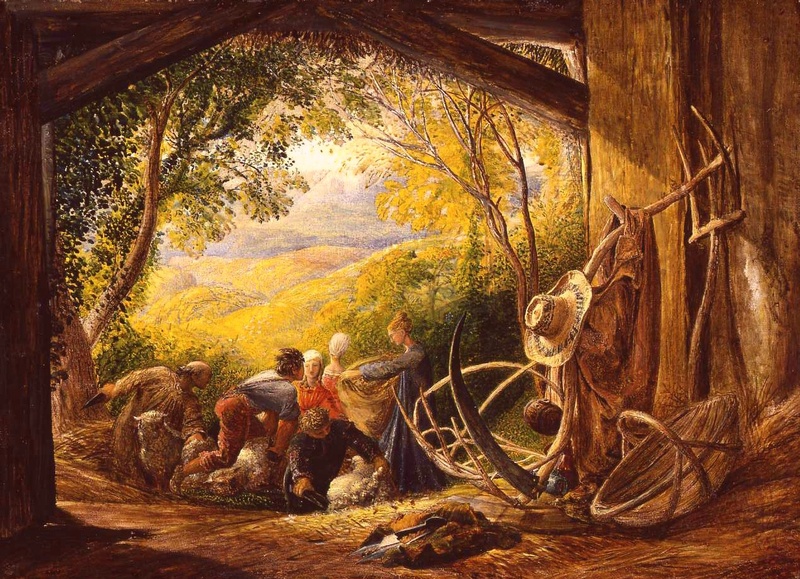 Samuel Palmer’s (1805-1881) The Shearers (c 1833-5) is a beautiful pastoral painting which might contain some symbolic references, although they remain obscure despite several expert attempts to read them. However, it lacks any coherent references to preceding or subsequent events, and once again fails to connect with a story sequence. John Singer Sargent (1856-1925), Carnation, Lily, Lily, Rose (1885-6), oil on canvas, 174 x 153.7 cm, The Tate Gallery, London. WikiArt. 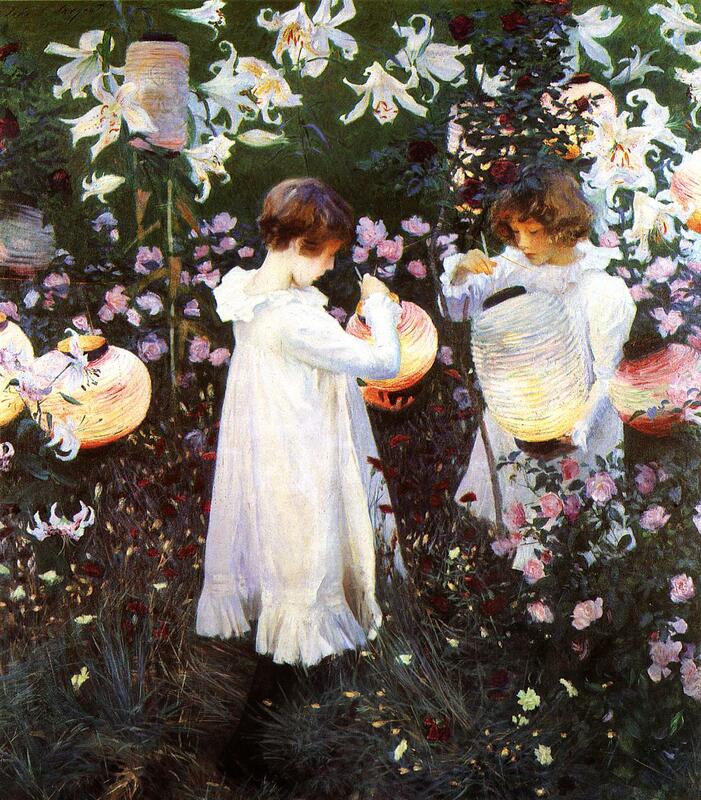 John Singer Sargent’s (1856-1925) Carnation, Lily, Lily, Rose (1885-6) is an impressionist double portrait of two young girls, which has been discussed in detail on Wikipedia and the Tate Gallery. Neither proposes any accompanying narrative. 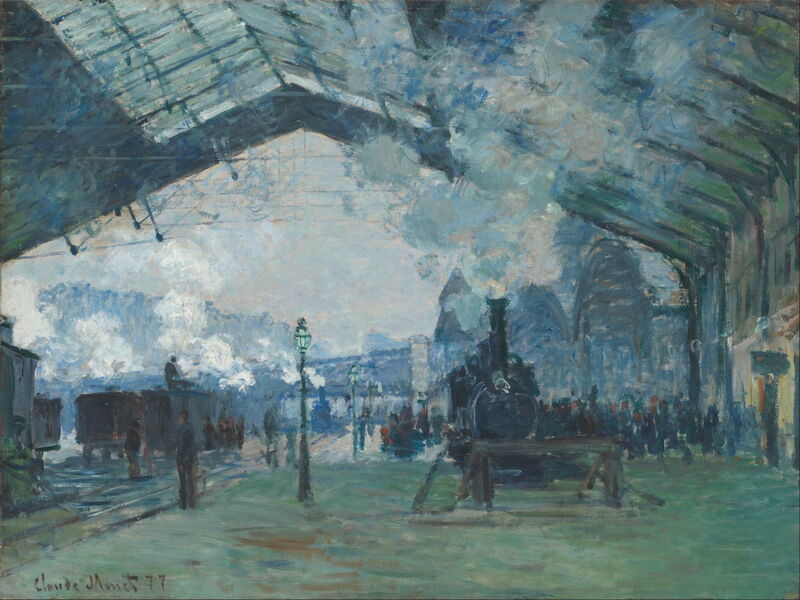 If you were to accept Frith’s The Railway Station (1862) as a narrative painting, then it would seem hard not to include those of Claude Monet (1840–1926) painted in front of the motif at the Gare Saint-Lazare in Paris: works such as his Arrival of the Normandy Train, Gare Saint-Lazare (1877). Claude Monet (1840–1926), Arrival of the Normandy Train, Gare Saint-Lazare (1877), oil on canvas, 59.6 x 80.2 cm, Art Institute of Chicago, Chicago, IL. Wikimedia Commons. 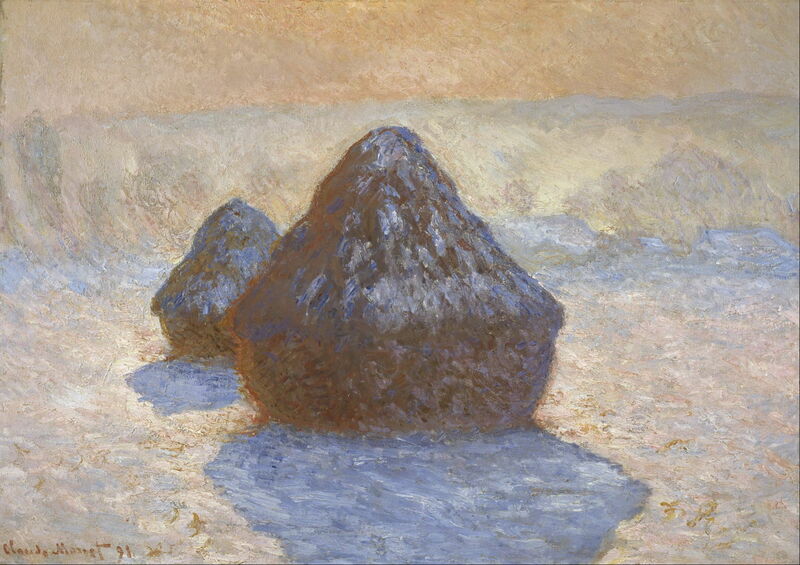 Equally if you are able to discover narrative in other pastorals and landscapes, surely Monet’s Grainstacks: Snow Effect (1891) is a narrative within a narrative series. That would in turn make the Impressionists devoted narrative painters, and rewrite the history of art. Claude Monet (1840–1926), Grainstacks: Snow Effect (1891), oil on canvas, 65 x 92 cm, Scottish National Gallery, Edinburgh, Scotland. Wikimedia Commons. In addition to being few in number, published studies on narrative painting are not consistent in the definitions that they give, and frequently include works which are inconsistent with their own definitions. It can be difficult to know whether some paintings are narrative, particularly when there is little or no evidence of the artist’s intent. However, the examples quoted above appear quite clear cut. If the text accompanying a painting fails to reveal or suggest narrative as is generally understood, then the author has failed to support their claim, which must be rejected. Posted in General, Painting and tagged Brown, Frith, Monet, narrative, painting, Palmer, Sargent, Sitwell. Bookmark the permalink.